When taking on a used bike there are bound to be trials and tribulations. However when taking on a bike over 20 years old, the emotional state of your bike can only be in greater flux. I bought the 1986 Kawasaki Concours because it was a good deal. Plain and simple. In retrospect I should have just used all my available funds and bought the newest possible bike, but instead I went for the best looking price for the bike model. This has led to me working on the bike far more than I actually rode it. Since April 2010 I think I put like 1000 miles total onto it, when I normally ride about 3-4k a year. The issues pinnacled this spring, when not only did a coolant leak start, but also the fork seals gave up the ghost. My bike riding hopes plunged into despair as I had little time or money to work on it myself, let alone the huge expense of trying to take it to a shop. My sabbatical was due this year, which seemed to be the perfect time to take it apart. This ended up being half true. Everything got apart just fine, however I discovered far more than I bargained for in what needed to be repaired. The constant discoveries of issues that plagued the bike along with the successes of repair milestones played havoc on my emotional state. Some days I would be up, others would be down and frustrated. This led the repairs to drag for many many weeks as days would go buy where I wouldn’t be willing to tackle the latest challenge. I think that the key here is not to give up. I learned a lot about myself in trying to keep myself motivated to continue to trudge through the plethora of issues that crippled my bike, and to try to keep it from impacting my state of being. In the end, I finally have a fully working motorcycle for the first time since I bought it a year ago April. It feels good too. I did these repairs. I made these mistakes. For better or worse, I get to have pride of ownership. Now hopefully I can get some riding in, hope to see you all out there, waving back to me on the highways and back roads. Don’t give up on your old broken motorcycle, as the rewards of completing the work or project is immense. 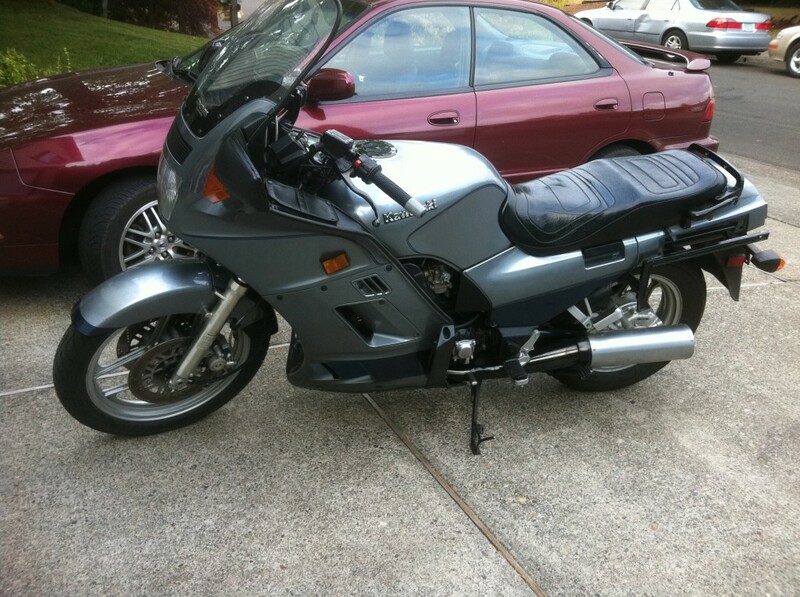 This entry was posted in Motorcyling and tagged Concours, manic depressive, repairs, ZG1000. Bookmark the permalink.